If you’re trying to dive into the sport, your first purchase will be, intuitively, a kayak. Your second purchase will likely be a quality fish finder. Size: The most important consideration. A kayak isn’t a large vessel. Many of your options will be portable fish finders – with waterproof batteries built in – as a big one would be a bit out of place and inefficient on a kayak. You probably won’t want anything bigger than a 6” display, and you’ll want to make sure it’s relatively lightweight. Transducer Compatibility: Certain kayak companies have partnered with companies to make sure that the transducers fit right into the scupper holes of the kayak. You may want to Google your kayak’s compatibility before you purchase your fish locating device. GPS or Non-GPS: If you’re fishing on a big lake, you may want a GPS so that you can mark your favorite spots. Now that we’ve got the basics nailed down, we’ll explore the nitty gritty details of five of the best fish finders for kayaks. A high-frequency sonar device that provides photograph-like images, making it easy to spot your target prey. Users of this device revel in the built-in maps and GPS making navigating your way to prime fishing spots a breeze. Whilst this model does have a smaller screen size than others in our list, it comes with many features not found on similar devices. The echoMAP comes with a fully-weatherproof housing and a 20-feet-long transducer cable, making it easy to locate the device where it suits you best. For larger vessels over 22 feet, an extension cable will be required, however, for Kayaking, this is perfect out of the box. The intuitive design and button size make using this fish finder easy (especially with cold hands or when wearing gloves), which is what propels it to the top of our list to win the Editors Choice award. 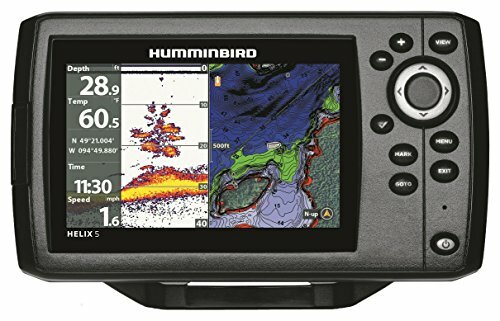 Although the screen is a bit big, this Humminbird model made our list because of its fiercely loyal following among certain kayak fishers. The Humminbird 409120-1 has a lot to live up to. Humminbird is known for its excellent customer service, and that’s good to know going in when you buy one of their models. The color picture is crystal clear, the sonar is informative, and the GPS is by all means relatively affected. That said, this Humminbird model doesn’t necessarily offer anything that its peer models don’t. It sits among the best fish finders for kayaks out there but doesn’t really stand out. It does the basics very well, but may not necessarily warrant paying the extra money. Moreover, it’s a bit big for a kayak, although the display is very easy to read in all conditions. 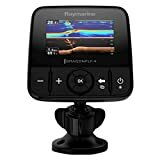 However, there is a cluster of kayak fisherman that ardently support this Humminbird model, and if you try it out, you may find that you’re one of them. 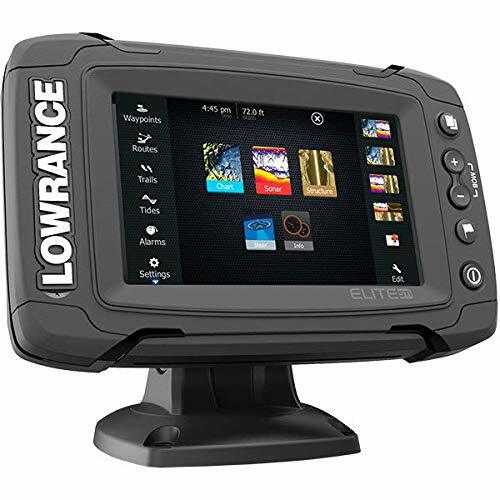 The Scoop: Boasting a color screen with a relatively small 4.3” display, the Lowrance Elite-4X is another great budget fish GPS model. The extra height of the screen is a bonus, as the screen’s vertical design is unique, useful, and easy-to-read. In terms of interface, this model is one of the best fish finders for kayaks. Also best suited for freshwater, the Elite-4X is relatively easy to install, only requiring plugging in two wires. However, some users say that its use isn’t very intuitive. Like the Echo 150, it’s user manual isn’t the best, and you’ll have to figure out how to do a lot of things by pushing buttons and experimenting. 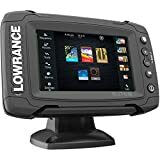 Though versions of this model have been discontinued due to a lawsuit with Lowrance, you can still get it off of the official Garmin website or other retailers. Boasting a GPS and a 500 W HD-ID sonar, the EchoMAP 44dv is a big step up from the budget fish finders. The GPS feature is huge for tracking your locations, and the sonar’s timing is coordinated with your boat’s position. 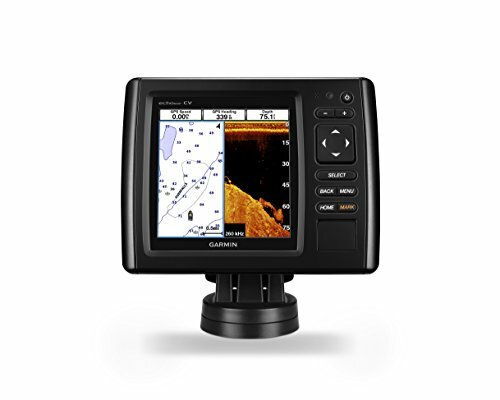 The Garmin DownVü sonar is arguably the clearest scanning sonar available right now. The cables plug directly into the mount, so mounting and installing are a breeze. The screen is extremely clear, and the maps are, by all accounts, excellent. Nevertheless, this uptick in features comes with a sizeable uptick in price, and only you can decide if it’s worth the money. The EchoMAP 44dv certainly has everything you could desire in a GPS finder, but it’s one of the pricier models on the market. 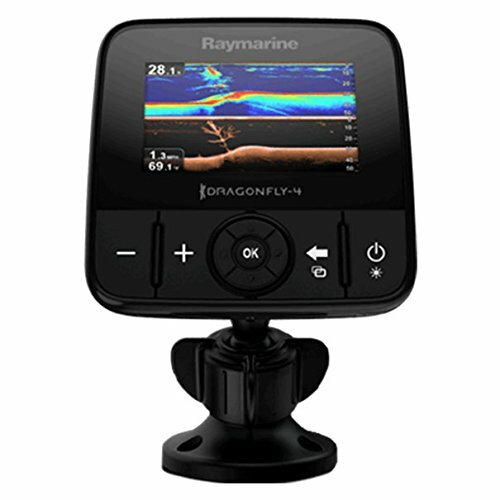 The Raymarine Dragonfly 4PRO offers GPS technology while also keeping your wallet relatively full. The maps are solid, including many lakes, rivers, and coasts, and the sonar and LED display to make this model one of the best on the market. One cool, social, millennial-type feature – with Raymarine’s Wi-Fish app, you can save and share your days catch with friends on social media. Moreover, at a sleek 4.3”, the display is perfect for a kayak. One user even claims to catch 3-10 largemouth bass in a relatively dry river thanks to the Dragonfly 4PRO. The Dragonfly 4PRO’s Achilles heel is likely Raymarine’s tech support, which has been roundly criticized by a few users. Perhaps more importantly, a limited number of users have reported huge navigational issues in slightly more remote areas. 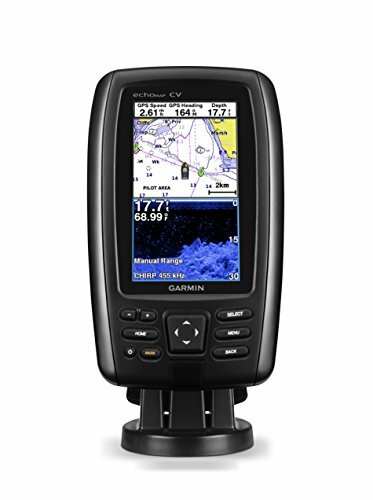 As such, the Dragonfly 4PRO is a cut below the Garmin EchoMap 44dv; however, that’s to be expected with the drop in price, and the Dragonfly 4PRO is a good middle ground if you want a fish locator with a GPS but don’t want to break the bank. As with most outdoor gear, you usually get what you pay for. If you are a casual kayak fisherman who is mainly fishing in the shallow fresh water, you may want to opt for less-expensive models. If, however, you find yourself out on the ocean casting for a bigger catch, the Garmin EchoMap or the Humminbird may be your choice. When you’re looking for the best fish finders for kayaks, always weigh your needs against your budget.